The Beyond Boundaries team met for their monthly seminar, with many guests, to discuss several problems with the history of West India in the mid-first millennium. The problem which motivated discussion was the dating of one minor dynasty, the Traikūṭakas, who are known from a handful of copper plate inscriptions and a modest silver coinage – and the first three presentations served to introduce the problem. Michael Willis began by talking about the use of imprecatory verses in copper plate charters. These verses, which warn any prospective malefactor who might seize the granted land that they risk 60,000 years in hell, are often attributed to the sage Vyāsa and sometimes specifically to the Mahābhārata. However, according to the critical edition of the Mahābhārata, they are only found in some southern manuscripts and not in any others. The verses are, as was shown in several slides, relatively common in fifth and sixth century charters, and are also known from a Traikūṭaka grant. If the Traikūṭakas were dated significantly earlier than the fifth century, and the seminar topic was chosen in part because they sometimes are, then this would make this the earliest usage and suggests a west to east transmission of the concept (rather than an origin in a North Indian Gupta context as is often assumed). 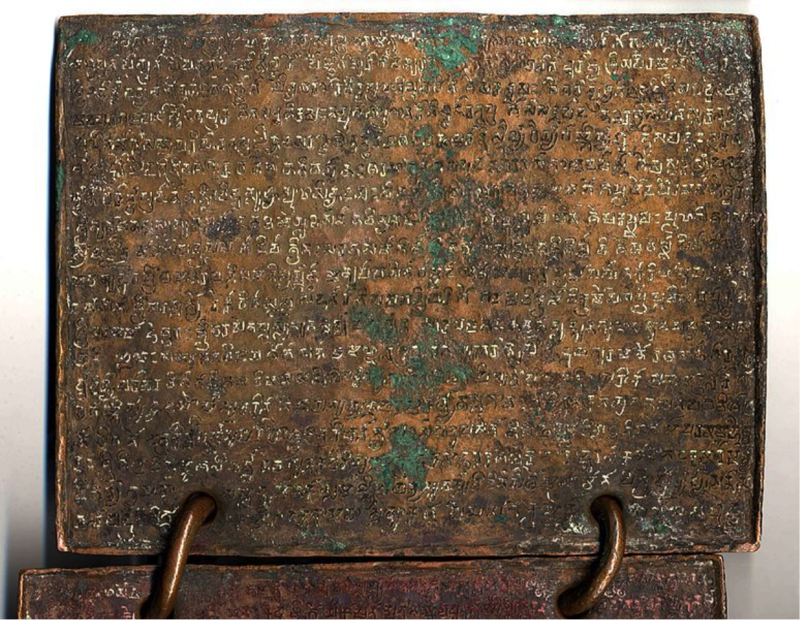 There followed a vigorous debate about whether it is reasonable to assume that the powerful dynasties who disseminated different aspects of court culture originated those ideas, and whether the copper plate charters are representative of the distribution of similar decrees written on more ephemeral material. The second presentation, by Robert Bracey, presented the numismatic evidence, which since the 1960s has been accepted by numismatists as demonstrating an early date for the Traikūṭakas. A small number of their coins, and the handful of inscriptions, record dates ranging from 197 to 284. What is at issue is whether, as most numismatists believe, those dates are in Śaka era of 78 AD or, as most epigraphers believe, in the Kalacuri-Cedi era of 249 AD. Robert presented the four arguments that have usually been deployed and critically re-examined them. He concluded that the arguments that the coins used the designs of third century Western Satrap coins, or that they fitted in a supposed gap in the Satrap dynasty, were unsound, but that the arguments based on the weight of the coins were compelling and those on hoards were compatible with an early date even if not strong. Prof. Hans Bakker then took the opportunity to perform the same role for epigraphic evidence. He presented V. V. Mirashi’s publication on the inscriptions of the Kalacuri-Cedi era which was prepared in the 1950s but not published until after Mirashi’s death. Taking the early inscriptions in turn Prof. Bakker demonstrated how each one could be attributed to either the Gupta era of 319 AD or the Śaka era of 78 AD, for all of the inscriptions before the year 200. He further pointed out that supposed references to the dynasty in the inscriptions were ambiguous, supporting both early and late dates depending on which reference you chose. However, two strong epigraphic arguments remained for dating the inscriptions in the fifth century and thus attributing them to the Kalacuri-Cedi era. The first is the palaeography, which epigraphers are unanimous in attributing to a late period. The second, which Prof. Bakker presented for the first time at the event, was in the prose passages which show a strong continuity of the scribal and courtly traditions from the Traikūṭaka inscriptions to those of the early Kalacuris. There followed a lively debate over the relative merits of these two strands of evidence which both seem to strongly suggest contradictory dates. There then followed several short presentations on related issues. Daniel Balogh began by speaking about the early Rāṣṭrakūṭas of the Deccan. If the Traikūṭakas employed the Kalacuri-Cedi era, and the dates frequently assumed for the Rāṣṭrakūṭas are in fact correct, then the latter would be the southern neighbours of the former. Daniel carefully laid out how the genealogical inscriptions have been used to reconstruct several generations of the dynasty. Francesco Bianchini then spoke about the Maitrakas. More firmly dated than the Traikūṭakas or the Rāṣṭrakūṭas, they ruled in the sixth century after the collapse of Gupta hegemony north of the Namada river in Gujarat. Francesco discussed the vexed problem of the dynasties ‘overlords’ who are frequently referred to in their inscription but never named, and whether these are the Guptas, the Huns, the Aulikaras, the Vākāṭakas, or a more deliberately ambiguous reference. Finally Gethin Rees spoke about the cave sites of West India and particularly Kanheri. Kanheri experienced several different phases of construction during which new caves were cut, structures were added and in some cases the existing caves were elaborated with new items. However, finding fixed chronological points to tie the relative art historical dating to is very difficult. 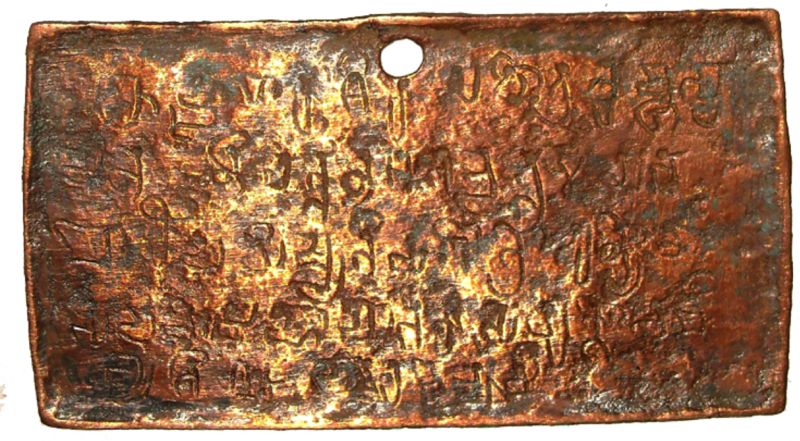 One of those which has received much attention is a Traikūṭaka inscription found as part of a relic deposit in a brick built stupa at the site. The seminar finished with a wide ranging discussion amongst the participants on the interconnections between these dynasties and the problems of chronology, cultural transmission, and political reality that the evidence presents. Though no firm conclusions were reached it was agreed that the complex West Indian states deserve more attention, preferably inter-disciplinary, than they have received up to now.